Be a SGWA Volunteer – Training May 19! Sign up now! Posted on 04/16/2018 by cyndijohnson | Comments Off on Be a SGWA Volunteer – Training May 19! Sign up now! SGWA Volunteer season 2018 is now starting! Orientation for new volunteers is May 19, 2018. 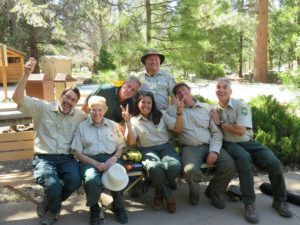 SGWA Volunteers work with the USFS to provide many services in and around the San Gorgonio Wilderness. We do trail patrols both day and overnight, trail work projects, and interpretive programs at the Grayback Amphitheater. 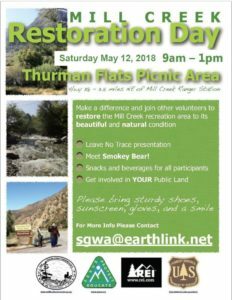 Many volunteers provide visitor information and assistance at Mill Creek Ranger Station front desk, Barton Flats Visitor Center, and the Big Falls Picnic Area. Volunteers interact with the public so it’s necessary to have an upbeat personality and be willing to help visitors. We are especially looking for experienced backpackers for overnight patrols. If you want to learn more about the forest, challenge your hiking skills, or just enjoy nature while helping others then this is for you. Sign up now! Comments Off on Be a SGWA Volunteer – Training May 19! Sign up now!